McArthur River was the largest producer of uranium in 2016. But what were last year’s other top uranium mines? Find out here. In 2016, world uranium mine production came to 62,012 tonnes, up from 60,496 tonnes in 2015. Kazakhstan was the top-producing country by far, putting out 24,575 tonnes, and it was followed by Canada and Australia. Together, those three nations accounted for over two-thirds of uranium production last year, with Kazakhstan taking a 39-percent share of world output and Canada and Australia taking 22- and 10-percent shares, respectively. A wide variety of uranium companies contributed to production. But where in the world are the top uranium mines? While many of them are located in Kazakhstan, Canada and Australia, that’s not the case for all of the largest uranium mines. To give investors a better idea of where the top uranium mines are located, we’ve put together a list of the 10 biggest, based on statistics and information from the World Nuclear Association. Read on to learn more about them. Located in Saskatchewan, the underground McArthur River mine is the world’s largest uranium mine, and its annual output is significant. Production at McArthur River dropped slightly last year, coming in at 6,945 tonnes compared to 7,354 tonnes in 2015. In 2016, the mine accounted for 11 percent of uranium production worldwide, down 1 percentage point from the previous year. Major miner Cameco (TSX:CCO,NYSE:CCJ) holds a 69.8-percent stake in McArthur River and is its operator. The company is entitled to 234.9 million pounds in proven and probable uranium reserves. AREVA Resources Canada, a subsidiary of AREVA (EPA:AREVA), owns the other 30.2 percent of McArthur River. Cameco has a mining license at McArthur River until 2023. The average grade of U3O8 mined at McArthur River is 9.6 percent. Cigar Lake is another one of the world’s top uranium mines. It is known for being the world’s highest-grade uranium mine, and has an average grade of 15.9 percent U3O8. Like McArthur River, the mine is located in Saskatchewan. Commercial production began in May 2015, and the company had produced 11.3 million pounds by the end of that year; in 2017, output is expected to total 18 million pounds. Cigar Lake accounted for 11 percent of worldwide uranium production in 2016, a rise of 4 percentage points from 2015. Cameco has 50-percent ownership of Cigar Lake, and has a mine license for the property until 2021. The company is entitled to 110.9 million pounds in proven and probable uranium reserves. The remaining 50-percent stake in the mine is divided between AREVA (37 percent), Idemitsu Uranium Exploration Canada (8 percent) and TEPCO Resources (5 percent). Production dropped at the Tortkuduk and Myunkum mines in 2016, sinking to 4,002 tonnes from 4,109 tonnes in 2015. The two mines are located in Kazakhstan, and are operated through a joint venture between AREVA and state-owned nuclear energy company Kazatomprom. Areva owns a 51-percent stake in the mines, while Kazatomprom has 49-percent ownership. The company’s partnership is known as KATCO, and was formed in 1996. Last year, the Tortkuduk and Myunkum mines produced 6 percent of the world’s uranium, down 1 percentage point from 2015. BHP Billiton (ASX:BHP,NYSE:BHP,LSE:BLT) owns the Olympic Dam copper–uranium underground mine in Australia. The mine has been producing since 1988, and in 2015 its output accounted for 5 percent of global uranium production at 3,233 tonnes; that’s down from 2015 production of 3,161 tonnes. Australia has the largest uranium reserves in the world, and holds about 29 percent of potential global supply. Production continues to rise slowly at the Inkai mine, another of the world’s top uranium mines. In 2016, 2,291 tonnes were mined at the Kazakhstan-based mine, up from 2,234 tonnes in 2015 and 1,922 tonnes in 2014. Cameco owns a 60-percent interest in Inkai, and the remainder is held by Kazatomprom. Cameco’s share includes 43.1 million pounds of proven and probable uranium reserves, and the mine generated 4 percent of last year’s uranium output. The 2,509 tonnes mined at the SOMAIR mines last year account for 4 percent of world uranium production. Production at the mines began in 1971, and stopped in 2013 pending a license renewal. Production resumed in 2014. The Budenovskoye 2 operation, also located in Kazakhstan, produced 2,081 tonnes last year, up slightly from 2,061 tonnes in 2015. Last year’s production is the equivalent to 3 percent of the world’s uranium, a drop of 1 percentage point from 2015. The Budenovskoye 2 site contains the Karatau mine, which is owned by the Karatau joint venture — the joint venture is a Kazakh-registered limited liability partnership in which privately held Uranium One holds a 50-percent stake. Production at the South Inkai mine began in 2009, and the project was responsible for 3 percent of the world’s uranium production in 2016. Production was roughly the same as the previous year, up slightly from 2,055 tonnes in 2015. The Kazakhstani mine is operated by Uranium One. The Central Mynkuduk mine started up in 2007 in Kazakhstan, and yielded 3 percent of total uranium supply in 2016. It is operated by a company that is part of Kazatomprom. Last on this list of the world’s top uranium mines is the Ranger mine. The open-pit mine is operated by Energy Resources of Australia (ASX:ERA), while Rio Tinto (ASX:RIO,LSE:RIO,NYSE:RIO) has 68.4-percent ownership. Ranger produced 3 percent of the world’s uranium supply in 2016. The mine has been in operation for 35 years and has produced a total of over 120,000 tonnes at an average grade of 0.244 percent U308. In 2015, world uranium production came to 60,514 tonnes, up from 2014’s number of 56,041 tonnes. While production was down in 2014 from 2013’s 59,331 tonnes, the increase from 2015 is promising. Kazakhstan was far and away the year’s top uranium-producing country with 23,800 and it was followed by Canada with 13,325 tonnes and Australia with 5,672 tonnes. 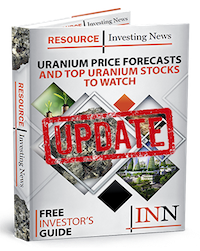 With those numbers and locations in mind, the Investing News Network took a look at the world’s 10 top uranium mines of 2014. Here’s a brief overview of those mines, based on statistics and information from the World Nuclear Association. Located in Saskatchewan, Canada, the McArthur River mine is the world’s largest uranium mine, and its annual output dwarfs that of other projects. Production at the McArthur River mine dropped slightly from 7,356 in 2014 to 7,354 in 2015. In 2015, the mine accounted for 12 percent of uranium mined worldwide. Cigar Lake is the world’s highest-grade uranium mine, located in northern Saskatchewan. Commercial production at the nine began in May 2015, with a total of 11.3 million pounds produced by the end of the year with a ramp-up of 18 million pounds per year expected by the end of 2017. Cigar Lake accounted for 7 percent of worldwide production of uranium in 2015. Production dropped from 4,322 tonnes in 2014 to 4,109 tonnes in 2015 at the Tortkuduk and Myunkum mines. The two mines are located in Kazakhstan, and are operated through a joint venture between AREVA and state-owned nuclear energy company Kazatomprom. Areva owns a 51-percent stake in these mines, while Kazatomprom has 49-percent ownership. The company’s partnership is known as KATCO, and was formed in 1996. Last year, the Tortkuduk and Myunkum mines produced 7 percent of the world’s uranium. BHP Billiton (ASX:BHP) owns the Olympic Dam copper and uranium mine in Roxby Downs, Australia. The mine has been producing since 1988, and in 2015 its output accounted for 5 percent of the global uranium, producing 3,161 tonnes, a drop from 2014’s production of 3,351 tonnes. The 2,509 tonnes of uranium mined at the SOMAIR mines last year equate to 4 percent of the world’s production. That being said, production increased from 2014’s 2,331 tonnes although global production dropped from 5 percent down to 4 percent. Production at the mines began in 1971, and stopped in 2013 pending a license renewal. Production resumed in 2014. Rising sharply up the list is the Inkai mine, who produced 2,234 tonnes in 2015, up from 1,922 tonnes in 2014. Cameco owns a 60-percent interest in the Kazakhstani Inkai mine, and the remainder is held by Kazatomprom. Cameco’s share includes 43.1 million pounds of proven and probable reserves, and the mine generated 4 percent of last year’s uranium output. Another Kazakhstani site, Budenovskoye 2 produced 2,061 tonnes last year, down slightly from 2014’s production of 2,084 tonnes. 2015’s production is the equivalent to 4 percent of the world’s uranium. The Budenovskoye 2 site contains the Karatau mine, which is owned by the Karatau joint venture — the joint venture is a Kazakh-registered limited liability partnership in which Uranium One holds a 50-percent stake. Production at the South Inkai mine began in 2009, and the project was responsible for 4 percent of the world’s uranium production in 2015. Production ramped up in 2015 to 2,055 tonnes produced from 2,002 tonnes in 2014. The Kazakhstani mine is operated by Uranium One. This Russian mine is owned and operated by ARMZ Uranium Holding Company; it delivered 3 percent of the world’s total uranium output in 2014. ARMZ Uranium Holding Company is the mining arm of Rosatom State Atomic Energy, which manages Russia’s efforts in defense, nuclear safety and nuclear energy. Located in Nambia, the Langer Heinrich mine is majority owned by Paladin Energy (TSX:PDN). In July 2014, CNNC Overseas Uranium Holding, a wholly owned subsidiary of China National Nuclear, bought a 25-percent stake in the mine. Langer Heinrich was responsible for 3 percent of the world’s uranium production last year.